Greece Travel Tips – Let’s have a look at some of the best places to visit in Greece here in this article! Greece has become one of the most visited countries in the world, and it’s easy to see why when you actually come here. There are miles of sandy beaches, an exciting and lively nightlife scene, incredibly restaurants and many places to shop at. If you want a vacation that is packed with breathtaking scenery, you cannot do much better than Greece. This country’s rugged yet beautiful landscape is just one of the things that make it such a perfect place for your next vacation, and it’s quite affordable. Arachova is a mountain town in Boeotia, which is located in the southern region of the country. Situated in some truly picturesque mountains, this village is certainly worth visiting. There are some great hiking trails and skiing opportunities for those who visit this country in the winter months. Numerous celebrities have been known to visit the ski resorts in this area, and it makes for an incredible day trip. Perhaps the most popular of all cities in Greece for tourists, Athens also has much to offer. This city has a fascinating history and lots of museums that you can visit to learn more about it. There are also lots of incredible towering monuments and attractions you won’t want to miss. The archaeological parks in the historic centre of Athens will provide you with a unique experience. Chania is also a popular place for tourists to go, and there are a few museums with some amazing ancient artefacts and art pieces that you will definitely want to see before going back home. The Maritime Museum is one of the more popular attractions in this area. There are a number of small villages that will allow you to experience Cretan culture in the most authentic way possible. Delphi is an amazing historic sanctuary that many Grecians see as the centre of the world, and it plays an important part in Greek mythology. If you enjoy learning about history, this is one of the absolute best places you can visit. Tons of tourists come to this place every single day because of its amazing beauty and cultural/historical significance. Epidaurus was an important place in ancient times, and many historians believe that it was a sacred place for Apollo and Asclepius. This historic site has an overwhelming majesty that you simply will not find anywhere else in the world. There were once a number of spas and structures here, but there are still some ruined remains for you to explore. Ermioni is a coastal town that will provide you with all of the picturesque beauty that you can handle. This city has lots of restaurants with delicious food, as well as shopping malls and markets where you can get some great souvenirs. There are a number of four-star hotels here as well, so you will definitely be able to find a great place to stay for the duration of your trip. Gythio is a town situated right on the water, and it is the capital of Mani. The beaches here are perfect for those who want to lazily relax in the sun and go swimming. The Caves of Diros is nearby, and it’s an excellent place to visit if you are looking for some adventure. The best time to visit this place is in the summer months. Halkidiki is located in northern Greece, and it has a reputation for its incredible forests and hidden coves. When you want to do some exploring in nature, this is the ideal place to go. There are multiple guesthouses right on the sea where you can stay here. Some of the exciting activities this area has to offer include hiking, cycling, water sports, and outdoor theatre. Heraklion is the capital of Crete and the largest city. You will be able to explore the history of this area through museums and guided tours. This entire area is known for its top-notch restaurants, so you won’t struggle to find a great little place to eat at while you are here. The Old Harbor is the perfect place to go for socializing and meeting new people. Kalavryta is a beautiful old historic town that sits right on the River Vouraikos, and it is one of the most popular day trip destinations in the country for tourists. This is also one of the more popular places to go in the winter because of all the incredible skiing slopes that you will find. If you have a lot of outdoor winter sports, you should seriously consider coming here when visiting Greece. Lasithi is yet another touristy area of Greece, and there is a lot to see and do. Vai is the most popular beach because of its incredible rock formations and crystal clear waters. You will absolutely love relaxing in the sand and splashing around in the water here. The countryside in this area is truly a thing of beauty, and it attracts millions of people each year. It is definitely one of the best places for sea bathing in Europe. But Lefkada also offers an infinitely green nature, mountainous terrain, countless pine woods, olive groves and vineyards. Lesbos is the 3rd largest Greek island. The island, nicknamed the island of olives, is one of the most fertile areas of Greece, characterized by the extraordinary beauty and diversity of the landscape. Lesbos has a turbulent history, many preserved sights that are spread all around the island and wonderful beaches. Mesolongi may be a small town, but it is still a great place to visit if you ever come to Greece. This town is known for its huge fishing industry, and the landscape is truly something amazing. 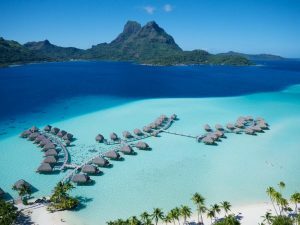 This is a very popular spot for honeymoons and romantic getaways, so you should keep that in mind when planning your next trip. 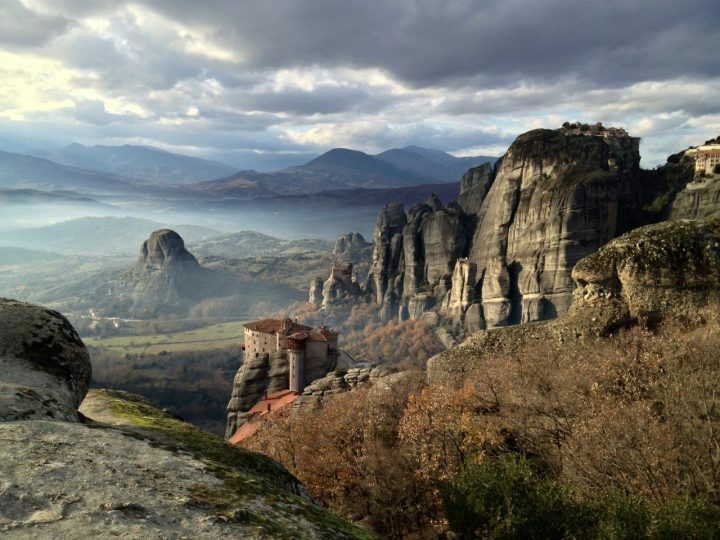 Meteora is a complex of impressive monasteries from the Eastern Orthodox religion, and it the scenery is unlike anything you have ever witnessed in your life. There are many different rock pinnacles and monasteries spread out over this area. These monasteries have been around since the 14th century, so there is a lot of fascinating history here to learn about. Monemvasia is a unique castle town located on a tiny island off the coast of Peloponnese, and it was an important place during the medieval period for a number of reasons. This is another excellent place to visit if you want to learn more about history. A lot of the old mansions from hundreds of years ago are still standing due to renovations made over the years. Mycenae is a fascinating archaeological site that is located not too far from Mikines, and it was the birthplace of numerous Greek historical figures. The first settlement in this area was around 700 BC, and it is made up of numerous structures that have withstood the test of time for the most part. If you are a big history buff, you don’t want to miss this place when visiting Greece. Mystras is an old castle with beautiful Byzantine architecture, and an important archaeological site that attracts many people from all over the world each year. This town also has some very impressive churches that were constructed in the same architectural style as the castle here. These structures are truly one of a kind, and worth taking a day trip to see. Nafpaktos is among the oldest towns in Greece, and it has a fascinating history going back over 3,000 years. The Castle of Nafpaktos has been preserved fairly well over the years, and it is an incredible sight. There are numerous cultural events that are held here each year, and tourists will enjoy numerous amenities. The large festivals that are held here in the summer are a lot of fun. As one of the oldest and most important archaeological sites in the entire world, Olympia is where the first ancient Olympic Games were held. There are numerous museums here where you can learn more about this area and its history. The palaestra and workshop of Phidias are just two of the historic sites in Olympia that you do not want to miss out on. Parga is a town where many people have summer vacation homes, and it’s a beautiful place to say the least. There are some incredible views of the sea, and it’s one of the best places to hit the beach in the warm weather. If you are looking for a picturesque place to go for your next trip abroad, Parga is certainly one destination that you should look into before making a decision. Pelion is a peninsula surrounded by mountains, and it offers an exotic beauty that you will be sure to enjoy. A lot of people come here and stay for days or even weeks because they just cannot bear to leave. There are a lot of small charming villages in the area that you can walk around and explore. The beautiful churches in this place are also worth checking out. Porto Heli is a very small town located on the eastern side of the Peloponnese, but it still has a lot to offer for those who want to get the most out of the warm summer weather. There are lots of great places to go swimming, fishing, and boating here. Lots of families come here on vacation from all over because it is such a beautiful and peaceful place to stay. Rethymno can be found on the western side of Crete, and it is in a bit of an isolated area. This is the perfect place for families because of how laid back it is as a whole. There is a lot of beautiful medieval architecture here, as well as wonderful places to eat right on the water. When you are looking for the right place to take your family in Greece, this is one of the best destinations. The Greek island of Rhodes has everything that one can expect from the perfect summer holiday: famous beaches, crystal clear sea, warm weather from May to October and countless historical monuments. Here you simply must visit the city of Rhodes which has been UNESCO site since 1988. Then make sure to see Prasonisi, Lindos, ancient city of Kameiros, Monolithos, or the Valley of the Butterflies. Santorini is famous for its small white houses and blue roofs. Perhaps the most famous of all towns and villages on the island is the village of Oia. It was built on a cliff overlooking the entire island and the volcanoes of Palia and Nea Kameni. You can also learn about the Minoan culture in Akrotiri, explore the monasteries, remains of the medieval fortification of Akrotiri Castle, walk up onto Mesa Vouno on the east coast, and see the castle of Pyrgos. Sparti is a small town within the city-state of Sparta, and it’s part of a very important ancient historic site. When you want to learn more about Greece, you should certainly make a point of coming here. This town will provide you with many amenities and guided tours that will afford you the opportunity to learn all about the ancient history of this place in depth. Thessaloniki is the second largest city in Greece, and it is home to a major airport where millions of people come and go through each year. The impressive Byzantine architecture of the buildings here is reason enough to visit, but there are also plenty of great places to go shopping. When you want a nice souvenir of your trip to Greece, this is one of the best places you can visit. Zagori is made up of over 40 different mountain villages, and you will find it in the northwestern corner of the country. A lot of people from other places around the world come here because of the breathtaking mountains and scenery it has to offer. If you love to hike or you’re into rock climbing, this place will have you wanting to stay forever. Turquoise sea, brightly coloured flowers, white beaches, mysterious caves, and diving with sea turtles. All this and much more can be enjoyed at the third largest island in the Ionian Sea, Zakynthos. Xigia Beach has become a natural sulfuric spa centre thanks to the sulfur contained in the seawater. Navágio is the most photographed beach in Greece. 31. Thassos – Govisity reader’s tip! Of the more than two thousand Greek islands, Thassos is the most northerly one. It lies in the Aegean Sea and has an area of 399 square kilometres and its coast is 95 km long. So how did you like these places? In case there are some more place you think are missing on the list, please let us know below in the comments and we’ll certainly add them!